When was the 4th Battalion (Taranaki Rifles) Wellington Regiment Cap and/or Collar worn? Is it a Volunteer badge, pre-1911 for the 4th Battalion of the Wellington Regiment (Corbet kind of alludes that they changed their name to become post-1911 part of the 11th (Taranaki) Infantry Regiment, so then the 11th's badge was universally adopted? Or is it post 1911, and they wore it as a distinction from their other comrades in the 11th, and until when (a hard to find badge, so I presume not for long)? Oldham has it in the Post 1911 section of his book. Attached are a couple of examples of mine to show what I am talking about. I would have thought most likely still worn in WW1, as with the large increase in numbers there would not have been sufficient badge. I know this happened FOR CERTAIN with North Auckland Mounted Rifles. I inherited my great uncles military belongings that had been stored in a drawer of the old Singer sewing machine by his sister since his death in 1917. There were tunic buttons,a set of 11th NAMR badges and paybook with misc documents. The "set" of NAMR badges was in fact 2 x III AMR (Boers Head) and 1 x 11th NAMR. He had no service in NAMR prior to 1914 when he joined Territorials, but these were his issued badges, he probably never noticed or took any interest in the difference. I am doubtful that the Taranaki Rifles, the Taranaki Guards and the Stratford Rifles, who were all company's of the 4th Battalion Wellington Rifle Volunteers, wore anything except for the bugle horn badge up until 1911. I am of the opinion that the 11th Taranaki adopted its antecedent regiment badge design with a change in the number to indicate its post 1911 unit designation. Other units who also adopted modified antecedent badges were the 5th Otago MR, 11th North Auckland MR and the 10 Otago Rifiles Regiments. Last edited by woronora; 14-04-19 at 04:51 AM. John, it is possible the 11th Taranaki adopted its antecedent regiment badge design, however I have not seen any photographic evidence to support that theory. Thus, as James has rightly pointed out, the IV Battalion Wellington Taranaki Rifles Regiment and the XI Taranaki Rifles Regiment with honour scrolls are somewhat of an enigma. 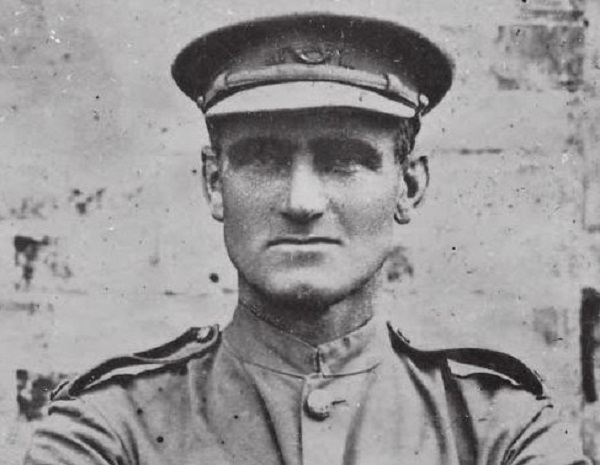 The following picture of a clean shaven Malone was taken in 1908 during the Wellington district Easter manoeuvres. As can be seen he is wearing a bugle horn badge with letters NZ on either side. Thanks for the update. Any ideas when the three different badges arose? I have been seeking the answer to that question for the last 10 years. On the 4th March 1911, Lieutenant Colonel William Malone sent the following sketch to the Officer Commanding the Wellington District for approval. This was of course before the Regiments were re-numbered. Unfortunately, I have not been able to locate the original revised rough sketch or photo, but the photo would have been like this one. General Godley, Officer Commanding the NZ Forces, approved the badge for the 11th Regiment (Taranaki Rifles) on the 24th July 1911. Sadly the IV Battalion Wellington Taranaki Rifles Regiment badge and the XI Taranaki Rifles Regiment badge with honour scrolls still remain an enigma. Until new evidence is brought to light, I can only speculate that Colonel Malone had the IV Battalion badges manufactured before approval was given regarding their design. Were they ever worn; only photographic evidence will tell? However it is possible they may have been allocated to a cadet unit attached to the 11th Regiment, as was done with the triple feather badge of the 13th Regiment, or it might have been as Craig has mentioned, issued to the 11th Territorial Regiment during WW1 due to the shortage of badges. Many thanks Brent for your help, at least your info has pointed out that both the banner and 4th Batt couldn't have existed before 1911, so are NOT Volunteer period. As you have mentioned, maybe these are just Gaunt trial badges, and they jumped the gun before the proper badge was agreed on (like including a hook on some of the 1911 formed badges). Certainly they have found another use, as the 5 or 6 examples of the 4th Batt I have handled over the years are never in pristine conditioned, and are usually polished or missing the odd lug (though could be overzealous collectors polishing and mounting).